We aren’t planning on getting new counters or appliances for a while, but I was tired of the sad decor and dusty cabinetry in our kitchen. I wanted it to be a place that I really wanted to work in, and we accomplished just that. The counters are a mish mash of cobbled together plywood and tiled tops in some spots, laminate in others. The appliances are black and in fairly decent shape, although it did take me the better part of an early move-in weekend to clean them. The paint job was an awful pale yellow with a sad apple border placed on top of an older border. Poorly matching to say the least. 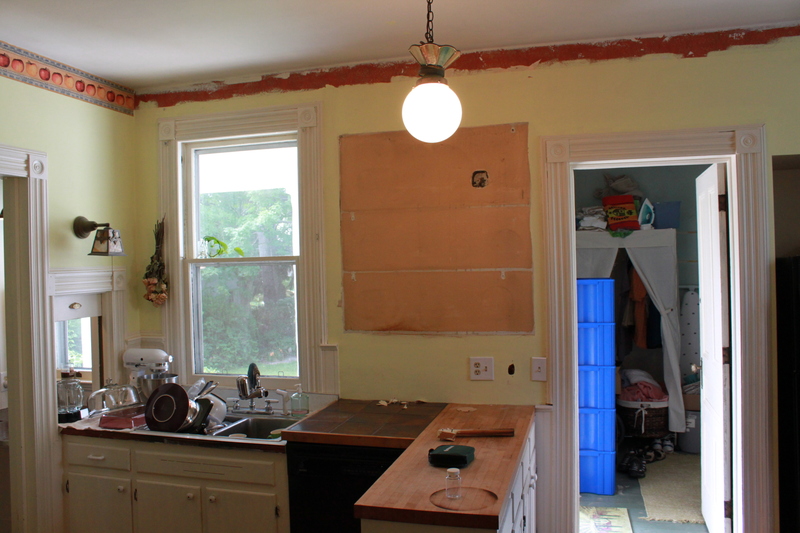 So, I began by taking down the old borders and Bill touched up the plaster work in both the kitchen and pantry. The pantry, by the way, is a full floor to ceiling butler’s pantry, with window and a swinging door into the dining room. 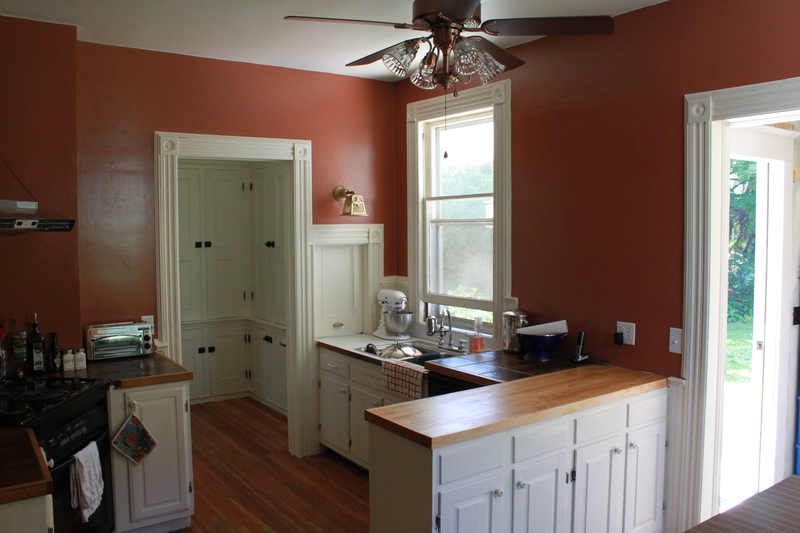 One of the first things we did last fall was paint the interiors of those cabinets to clean them up. It’s a luxury to have such a huge pantry, and its beautiful to boot. Unfortunately, I still need to finish painting it, but I just had to share this post on the completed kitchen. After a few days of wallpaper removal and plaster work, we primed and then I painted a few coats. I have chosen a palette for the whole house, so every room goes with the next one, and in looking into one room from another, there is a synchronicity. Since the dining room is a soft green, I thought the pantry and kitchen would look good in a deep rusty orange, really the color of a football. I’m quite pleased with the outcome, as the kitchen is very warm and Tuscan feeling. My plum dishes fit nicely in both rooms. After the painting, I spent hours cleaning the woodwork so that I wouldn’t have to repaint at this time. Every once in a while there is still a lingering “pet odor” from the multitudes of dogs that lived here long before us. But, every cleaning makes it better. Then, Bill put in a new ceiling fan light to replace the potpourri light that was there. Can’t describe it well, so I thought I would attach a photo. We polished the light above the sink, thinking it might actually be 80 years old. As a last touch, Bill sanded and resurfaced the large cutting board block that is our penisula counter. It is warm and homey, ready for bread baking and winter stews and long conversations with good friends. I never thought of myself as a writer … and perhaps I’m still not one but blogging is addictive and quite fun! It’s not as much fun as working on the house but it makes for a really nice departure when I’m physically tired and worn out! 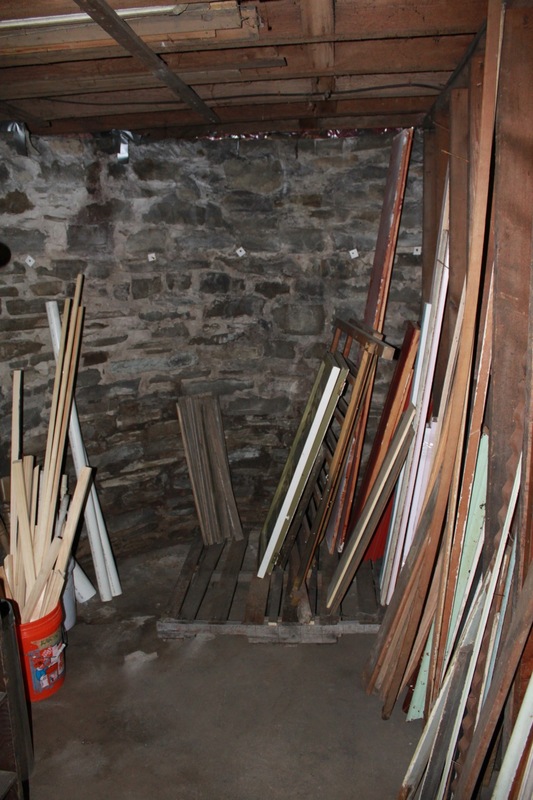 Since Karyn had previously written about the attic, I thought it fitting for me to write about the basement. Karyn tells me that the basement will be interesting to some folks, especially friends and family in the southern states who typically would not have basements. That’s just bizarre to a “Yankee” like me (Note, I am not a Yankee fan … I really don’t understand most organized sports) who grew up with New York basements all my life. I mean … where else do you keep your monsters, boogie-men and goblins to scare the kids with? I wonder what they did with that lion …. In all seriousness, our basement is pretty cool … literally! I LOVE the basement because all summer long it feels like it is air-conditioned. If I get too warm I can just go down for a tool or to “check something” and cool off! We do need to run a dehumidifier on the most humid days of summer but otherwise it is perfectly cool and comfortable … just how I like it! Mold and mildew can be a problem for many basements. 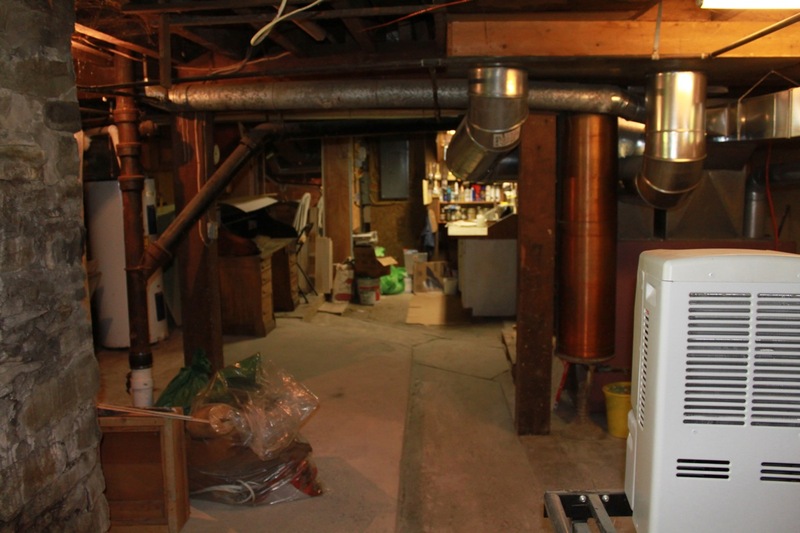 We are lucky to have a fairly dry, mold-free basement. There was evidence of moisture in one small section of the basement. Rain runoff was collecting near a low spot outdoors and seeping through the basement wall however that has been remedied by new rain gutters on the house. And It of course has that old house musty smell which makes it the perfect setting for my wood working shop, storage for pellets for our pellet stove, a paint station for all of our paints, vanishes and coatings for fixing up the house as well as a small room that will someday be turned into a small wine cellar! The original access to the basement was changed at some point in time; likely soon after owners of the home no longer had servants. The house layout was designed so that house servants could be isolated from the entertaining and living areas easily. Servants could cook and clean and navigate from basement to attic without interrupting most of the daily living space. This included a staircase from the kitchen to the basement and a second staircase from just outside the kitchen to upstairs. The second staircase going upstairs was removed which left space to create a larger and safer staircase to the basement. There’s also a door to the basement from the driveway making access from outside very easy and convenient for loading and unloading items. The basement wall construction is stacked stone and mortar. This is very common for the age of the house and the region. These stones were likely local stones cleared from farm fields. You can still find stone piles in hedgerows between fields here and there in rural NY. The original coal bin / room is still in place. Someone had removed the door and relocated it about 10 feet closer to the stairs so a new oil tank could be installed. Someday this will all be cleaned out and turned into a wine cellar but for now it’s a treasure trove of old moldings to use in the house renovations! Looking up at the subfloor you can see that the subfloor boards were all installed at a 45 degree angle to the floor joists. The angle makes for a very sturdy and stable floor construction. Our house is over 200 years old and the floors barely squeak! 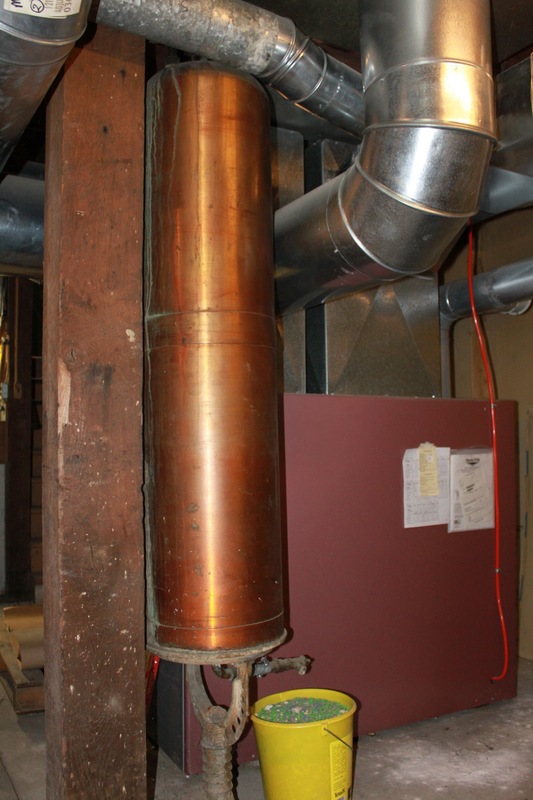 The absolute gem of the basement is an original copper, double walled hot water heater. While the burner portion is no longer in place, the stand and tank are and they are still plumbed and being used as a holding tank to the modern electric hot water heater. This tank is a unique antique and is hard to find one like it. Many have been scrapped for the copper. I’ve had two engineer friends over and they both have just drooled and stared at the tank. Total tank envy! Another antique is a double basin slate utility sink. The sink is in amazing condition and is useable. There is hot and cold water at the sink however it is not plumbed for a drain … a future plumbing project indeed! Never enough tools, never enough space! My shop is in half of the basement. It’s far from being organized well so I’m a little embarrassed of the space but it’s coming along. There were odd built-in work surfaces there when we moved in that had I mostly removed to make room for tools and tables. The metal racks were here, unassembled and brand new. They are dog food racks for a pet store but work great as tool racks. While it’s not quite a furniture shop like I want, it’s perfect for the work we’re doing on the house. Perhaps much later I’ll turn it into a full-blown furniture shop. The reason there were dog food racks left behind is that the previous owners owned a pet store in a nearby small city called Vestal. 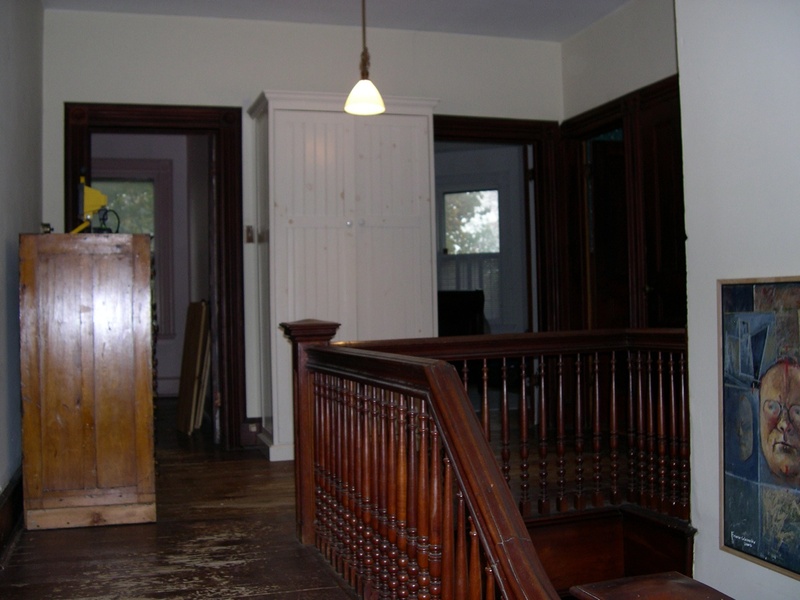 Much of the damage to the interior of the house was done by the store’s inventory. We’re told that when their store was closed, they had roughly 30 dogs and several caged birds left. All were brought to the house until they could be placed in homes. The dogs did significant damage to the floors and we’re just about done finding bird “artifacts”. Karyn bought me a new table saw for my birthday last year. I have that set up near the back of my shop space as it has a long enough opening for ripping longer boards. The saw is really great and works very well. It’s the safest saw I’ve owned and has some really great features that make woodworking more enjoyable! 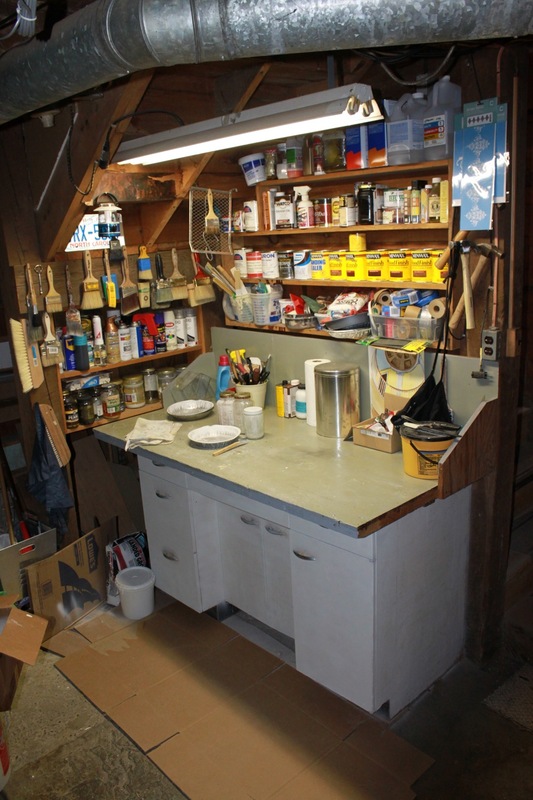 Karyn made a really great little paint center out of some shelves and an old sink and countertop that were already in place. She’s so organized. The only reason there might be a little mess here is because of me! I need her help in my shop! 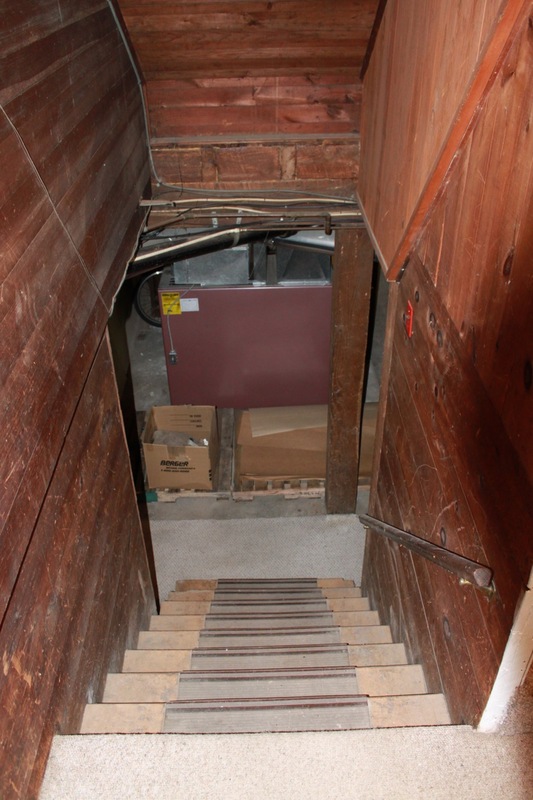 So all in all, a pretty cool basement with no boogie men found yet … but we’re still hoping! Well, there isn’t a lot to show this week in pictures because the progress shots aren’t nearly as exciting as the finished pics with the “before” alongside. But, I can promise you there is a lot happening. This week, I started working on the kitchen. No, the bedroom isn’t complete, but I needed a project of my own while Bill plasters his heart out. He has done such a beautiful job in the Master bedroom that I’m still shocked it looks almost normal. 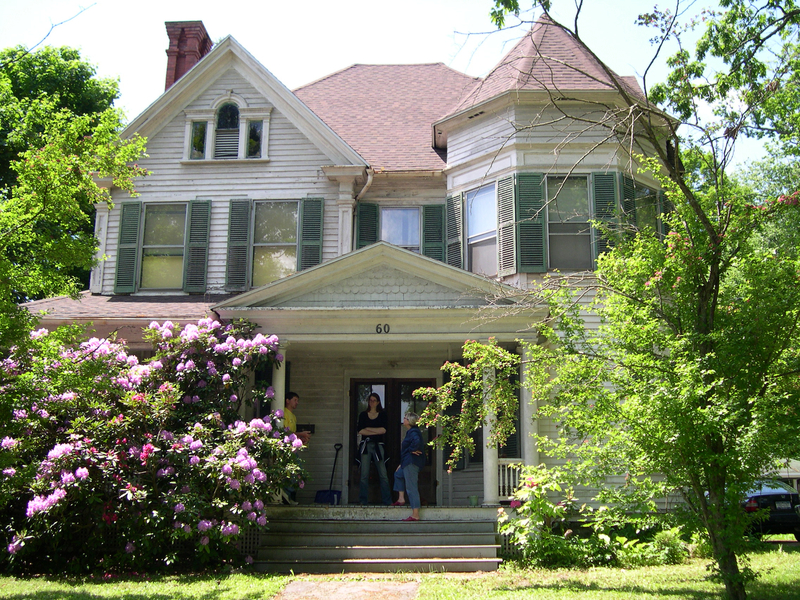 AND, we’ll be able to move in this fall. I’ve picked out colors, stencils and I’m ready to put on the finishing touches. 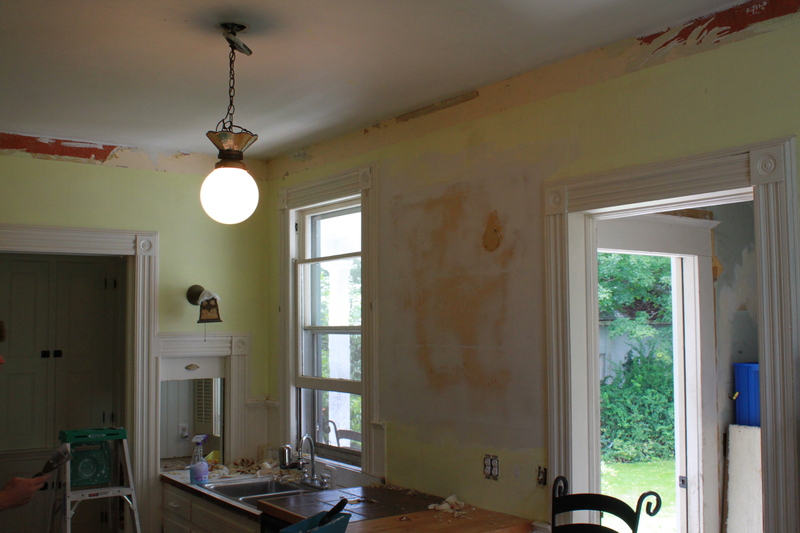 While he works on that ceiling, I started peeling wallpaper in the kitchen. 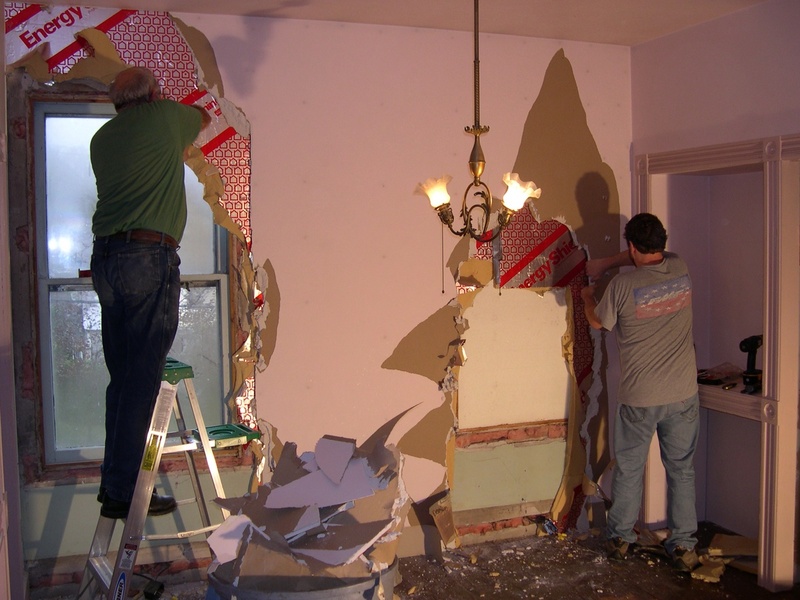 To peel wallpaper in a normal setting, one would find a corner and just pull. If it is put on correctly, it will come down smoothly without marring the walls. “Put on correctly” meaning that the walls were primed beforehand. In our case, most of this paper was put directly onto sheetrock or plaster, meaning that it takes hours to pull down 4 square feet. The reason people put up wallpaper on un-primed surfaces is that its cheaper and it sticks really well. I’ve spent four afternoons, so far, peeling down the border in the kitchen. Spraying with a mix of water and fabric softener loosens the glue and then I can scrape with a razor blade. Once I’m done, I’ll prime and paint. We aren’t changing out appliances or counters in the kitchen yet, though it could really use it. Down the road we’ll either custom build or get something more suitable. Right now, there is just a mish mash of cobbled together counters and parts. Except for the spacious butler’s pantry. 🙂 Yum! I’ll shed light on that space down the road. And, I mentioned the library in the subject for a reason. . . There are several other ongoing projects that we have yet to mention. 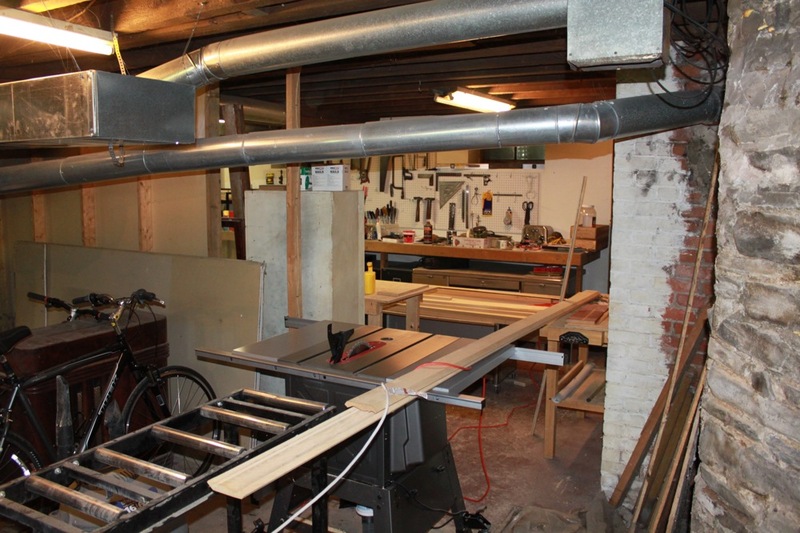 Bill is setting up his wood-shop in the basement, which is in process because of ongoing projects and major clean-out needed down there. We have also finished the library, which was originally the front parlor, except for the bookshelves and stencil work we’re going to to. It will definitely be my favorite room in the house once it is complete. And, last November, we put in a pellet stove, which was a small overhaul in itself. All of those we have yet to share here with photos, mainly because we want those pieces to be complete before you see them. There is much to come! mention the floor) all need resurfacing, molding is missing and windows are in need of repair and paint. We knew this room would take considerable effort since it’s the largest of the four bedrooms and upon first glance there’s more noticeable plaster damage in this room than any (not counting the stairway and upper hall areas). The master bedroom also has the primary brick chimney (nicely finished in plaster) running through it on the eastern wall. And chimneys, despite their massiveness actually like to move … and movement is what causes plaster to crack. The chimney was reworked about 6-8 years ago and is stable and in excellent condition. It’s very likely that at the time of building scaffolds and working on the chimney, the chimney’s surrounding areas were stressed and cracked. It’s a very attractive chimney, only double flue but large and decorative. Many neighbors comment the chimney being the nicest in town but I digress. Future plaster damage caused by the chimney’s movement should not be an issue so on with the renovations! We’ve chosen to renovate vs. remodel. While the difference seems subtle (since both terms have been bastardized by many websites and TV shows) the difference in approaches and activities can be significant. A neighboring house very close to us is being truly renovated and conserved. We are told the owner has been at it for over 15 years and will likely never finish. Honestly, we’re really doing something between renovations and remodeling however we try to lean towards renovation, the more conservative and less invasive approach while maintaining as much original materials and craftsmanship as possible (and as much as we can afford). Renovations tend to value the original materials and methods used while taking a conservative, less invasive approach. Remodels tend to allow major intervention and demolition with less concern and respect to materials and craftsmanship and tend to have more desire to modernize. It is our opinion that the homeowner has a responsibility to the integrity of the home. That’s not to say they have to follow any specific guidelines or rules but they should steward the home as best they can, consider the homes original craftsmanship, materials and intent and make thoughtful choices. One example to share pertaining to the Master Bedroom is the decision to stabilize the existing plaster on the ceiling as compared to taking it down and starting “new” or covering it up with sheetrock or another material choice. 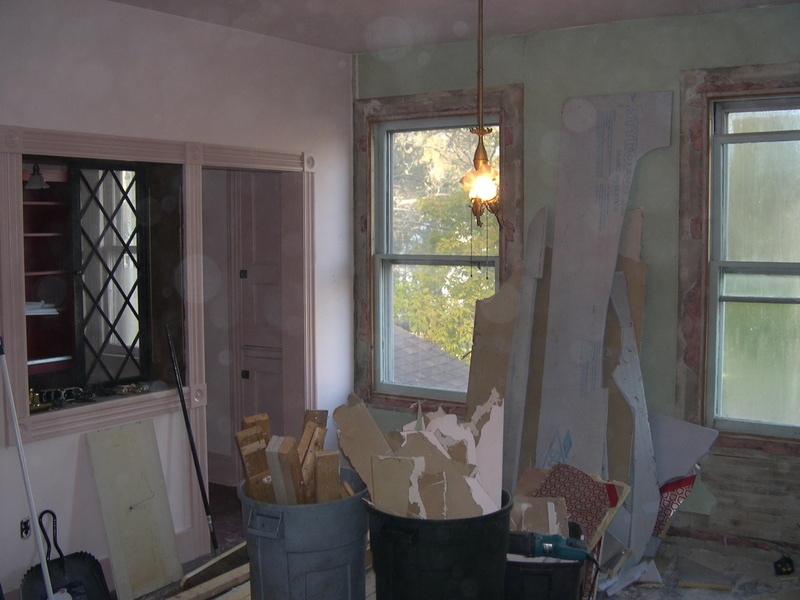 The decision to stabilize the existing plaster allows us to retain the original plaster and to a large extent is less work than the demolition and rebuild a new ceiling would require. Most commonly, a remodeling approach would be to “hide” the current ceiling behind a new sheetrock ceiling, maybe tearing out the original damaged plaster (including the plaster that is stable) and installing a new sheetrock ceiling or worse (in my opinion), hide the damaged plaster behind a “drop ceiling” and hope it never comes down! 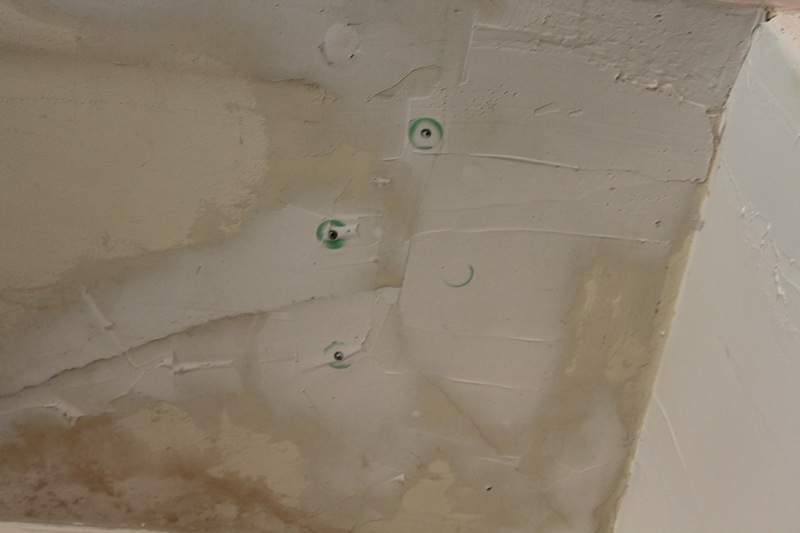 I researched several approaches to stabilize ceiling plaster that has already partially separated from the lathe. This becomes a key concern (pun intended … keys are the plaster that gets “smooshed” between the pieces of lathe which create the physical mechanism for the plaster to adhere to the ceiling or wall) … ok, I digress again … The keys being damaged is an important factor in the renovation process and must be dealt with first. Any subsequent materials applied to the surface of the ceiling will only weigh the ceiling down and further damage the plaster. The existing ceiling has to be stabilized before anything is added. First, the cracked area is carefully scraped as clean as possible of any loose chipping or peeling paint. Sometimes, as it is with this damaged area, there may be some water damage from previous roof leaks. Water damage often causes paint to delaminate from its substrate so thorough removal of the poorly adhered paint is best. I had to work carefully as to not upset the plaster much more. It’s already damaged and more damage due to my scraping is not wanted! Many methods suggest that gouging out the crack to fill it with plaster is best. I’ve tried this method on walls and while it can work, I wanted to try something less invasive on this ceiling. So to some extent, this is a test for me personally! Instead of removing plaster along the entire crack, the new method suggests drilling 3/16th holes every 3 or so inches (about 1 inch from the crack) along both sides of the crack being stabilized. Most of the holes drilled will hit lathe, some might be located between the lathe in the plaster’s keys. Either is acceptable but the lathe holes are preferred. After the holes are carefully drilled, each hole will be liberally filled with Liquid Nails construction adhesive. Now this is where we could easily argue that Liquid Nails is not a historically accurate material to use on an 1895 home. We could argue but I’m not going to … like I said … somewhere between renovation and remodel. Seriously, I have no problem using modern materials to attain safety, security and an aesthetic that replicates the original or helps me preserve the original materials and appearance. After the holes are filled I use sheetrock screws outfitted with large plastic washers to “clamp” the plaster in place while the glue sets. Depending upon how concave the surface is will influence if the screws stay or not. In one area near the chimney the screws are far beneath the overall surface so they will stay! If it seems that the screws will protrude proud of the surface I may remove them after the glue dries. I then work stone and tile adhesive into the crack as well as I can. This helps “glue” the actual crack line more strongly than plaster or joint compound. At this time, this is exactly where the ceiling repairs have been left. The next steps are to apply the reinforcement mesh and skim coat with joint compound mixture. We are working on the walls at the same time and have don some mesh and plaster work we can show and explain. It;s the same procedure that will follow for the ceilings. a strong matrix of old and new plaster. The wall cracks were very slight with no damage to the keys so there was no need to do the drilling and gluing and screwing to these walls. The wall pictured here with Karyn applying mesh had several “large” cracks and many “smaller” cracks with no separation from the lathe. Very stable really, just cracked significantly. The mesh is self adhesive but the real strength of the repair comes from skim coating several coats of plaster or joint compound into the cracks and filling the texture of the mesh. these coats of plaster sandwich the mesh between the old wall surface and the new … a very strong matrix that will resist future cracking and provide a smooth wall surface to paint or wallpaper. We’re still skim coating joint compound on every surface in the master bedroom. There are a few repairs left to make on the ceiling and all the walls need at least two more coats of plaster to make them smooth. Karyn was practicing her plaster technique in the closet (yeah, the plaster in the closets need some help too) and she’s just about ready to plaster more public walls! There’s a lot of surface to cover still so stay tuned for at least another one or two posts for this room! We still just dreaming about painting in here but Karyn has the color picked out and I’m not spoiling the surprise of her finish choices in this post but let’s just say I’m lobbying for a very fancy decorative finish! Rooms you’ve not seen. . . Since the master bedroom saga will be ongoing for a while, I thought I would show you a tour of some of the rooms we haven’t yet shared. Rooms that are way down on the list of getting in order. 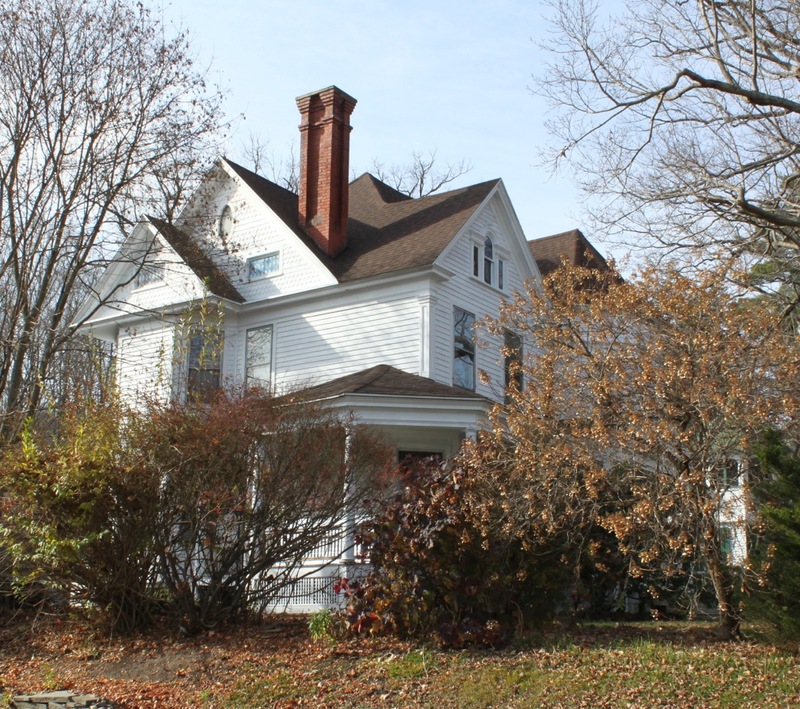 The house has four main rooms downstairs and a half bath, and four bedrooms upstairs and a full bath. Out of those ten rooms, we’ve completed three (the library which we haven’t yet revealed) and we’re onto our fourth, the master bedroom. 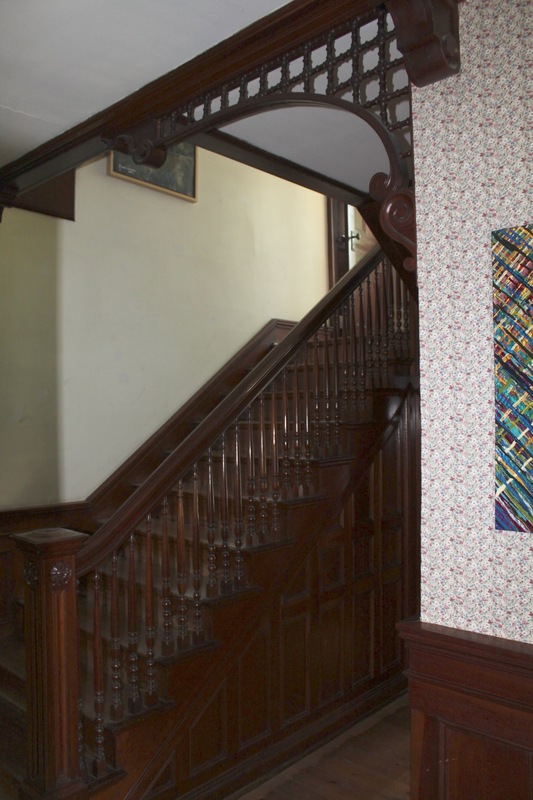 The hallway, however, is quite large in itself, and very intricately designed with cherry paneling and woodwork all the way through to the second floor. Once the floors are done and the ceiling replastered, it will likely be the most spectacular part of the house. I intend to stencil it quite delicately as well. The living room is nothing special right now, though completely usable. It’s got an old coal fireplace, which we removed and replaced with a stove for optimum heating. Currently, its painted an odd red color, but in fine enough shape that we live in it comfortably. We’ve shared the dining room already and the library, or parlor, is yet to come. 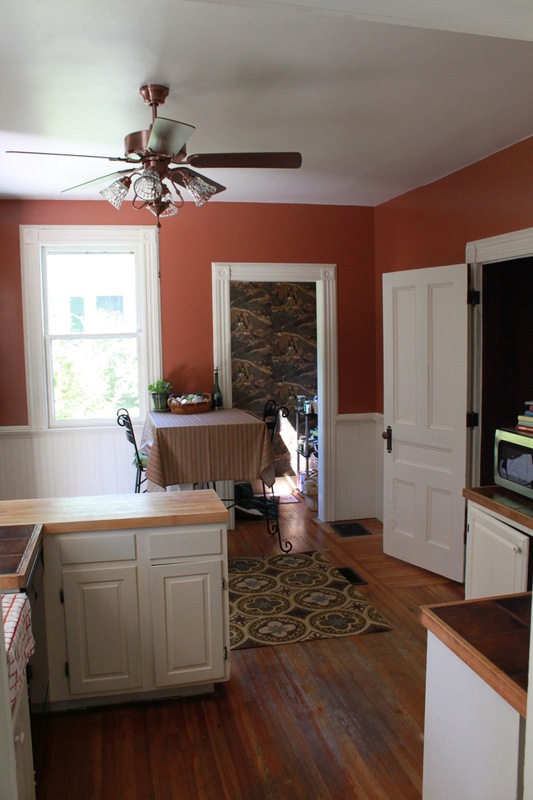 Lastly, downstairs is the kitchen and butler’s pantry. Though it might be a while before I’ll have new cabinets, its still a comfy working space and brightly lit. 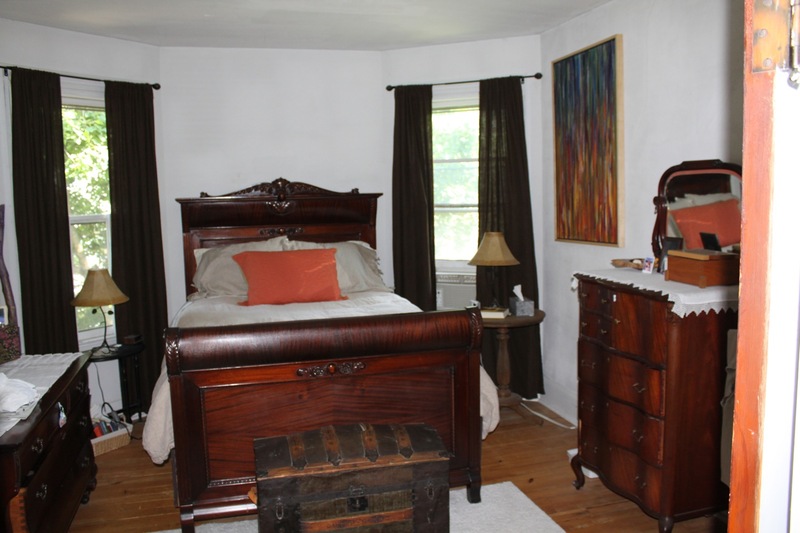 Upstairs, besides the master bedroom, we are using a back bedroom for our own, and there is a second guest room. The smallest bedroom is my studio for now, and I hope to keep it that way. 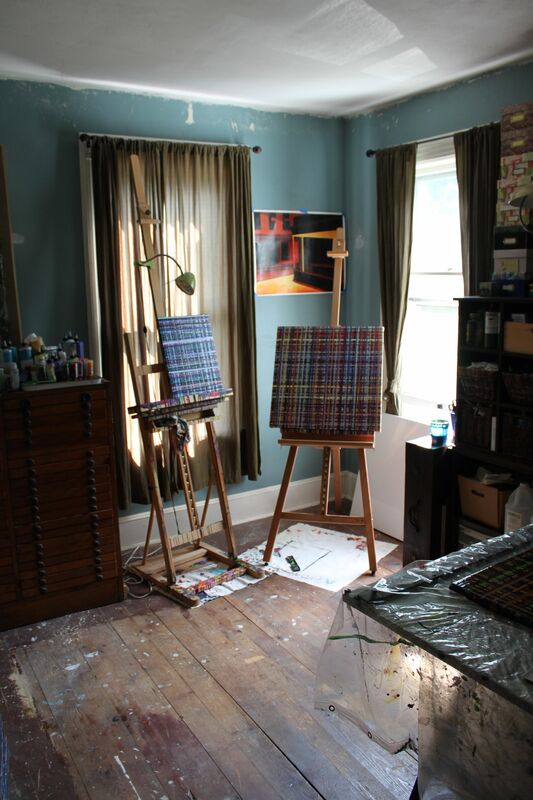 Bill thinks I should take something larger, but I really like the crowded space for studio work. I’m not one of those people that likes to spread out. 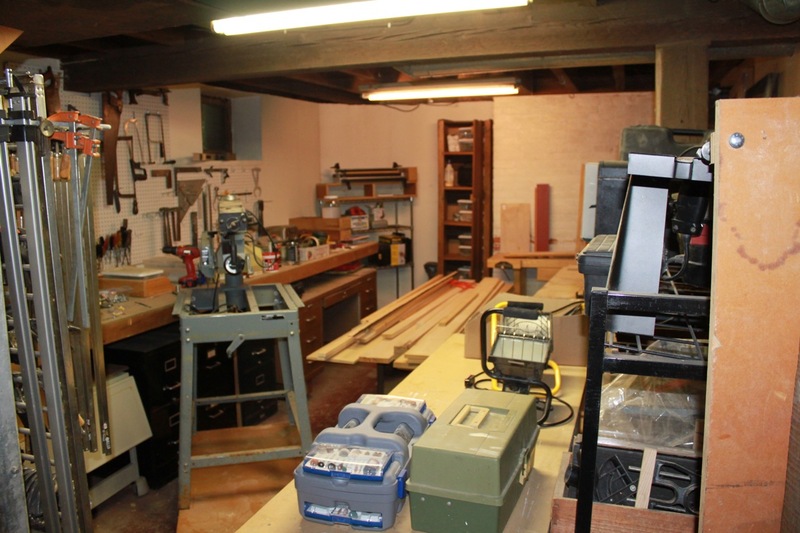 Lastly, the house has a full basement, which is currently Bill’s wood shop and paint storage. It runs a bit damp, and a little too dark for my taste. But, we’ll eventually make it more usuable and even add a wine cellar if we can get that far. At some point, we’ll have to discuss the garage, too. It has held treasures of its own, considering it has its own attic and is larger than a normal one car. Way off in the distance will we be able to work on it. 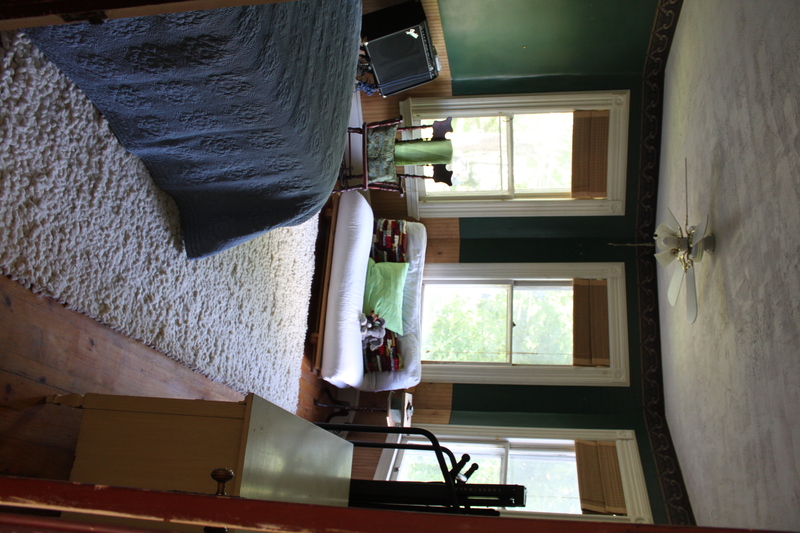 Posted on August 4, 2010 Author KarynCategories Bedroom, hallway, inside, studio, Tour6 Comments on Rooms you’ve not seen. . .
We’ve put in about 10 full days of work so far on the Master bedroom. That might not sound like much, but ultimately those are weekend days with both of us working on the room. And, we’re likely not even halfway done. To give you an idea of how we have spent that time so far. . .
Day 1 & 2: Dad and Bill pulled out sheet rock covering windows and removed faux closet and shelves. Day 3: Bill and I worked on the front window sash cords. 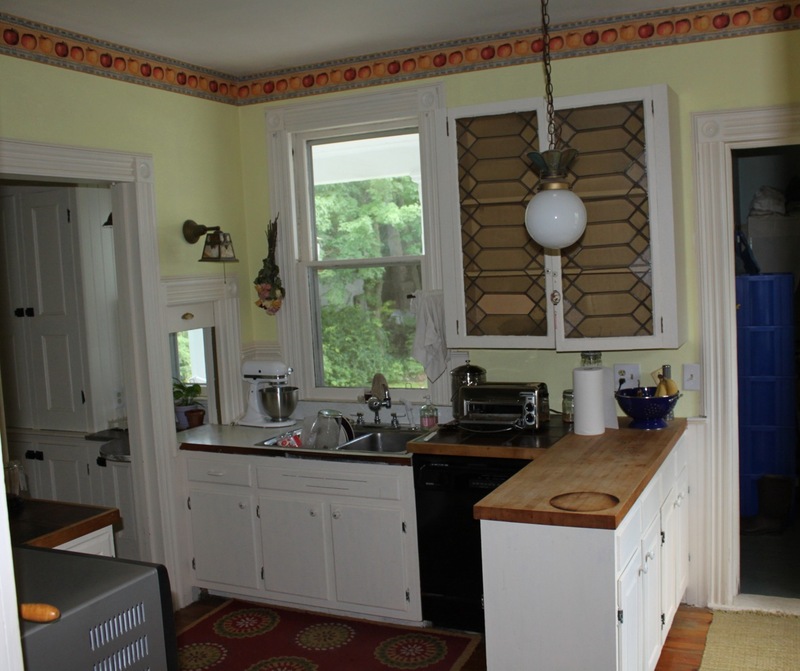 All of the windows in this house are double hung, meaning they open from the top and bottom. Most of the sash weights are in place for each window, except those two windows in the front in the master bedroom. So, I had to dig around the attic and basement looking for stray weights. 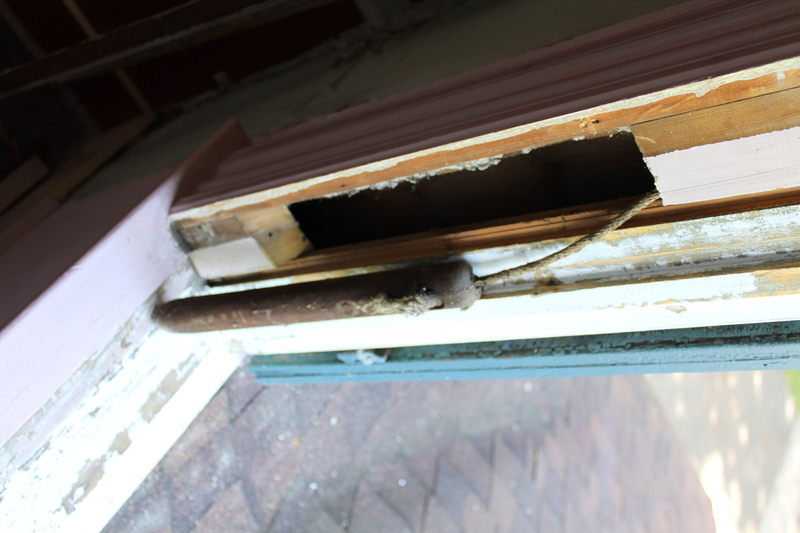 Then we had to pull out all the insulation alongside the sashes in order to put in the cords so the windows would work. It’s a beautiful system and easy to do IF there isn’t insulation stuffed in the pockets. 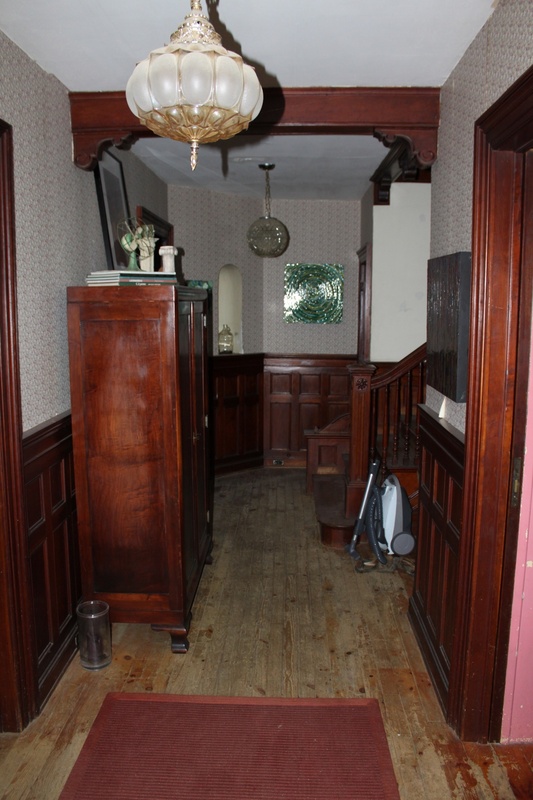 As you can see to the right, there is a pocket in the woodwork seemed in beautifully. It removes with a single screw and then each weight for that side of the sashes can be accessed. So, the old cord needs to be cut, and a new cord fed through the pulley at the top and tied to the weight at the bottom. The windows open easier than the new vinyl ones once the cords are working. 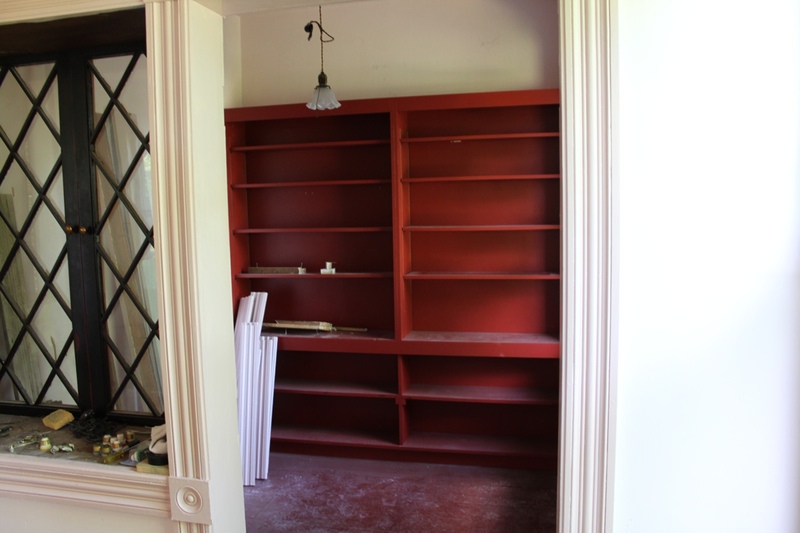 Day 5: Bill took down the lovely bright red shelves in the bedroom nook. 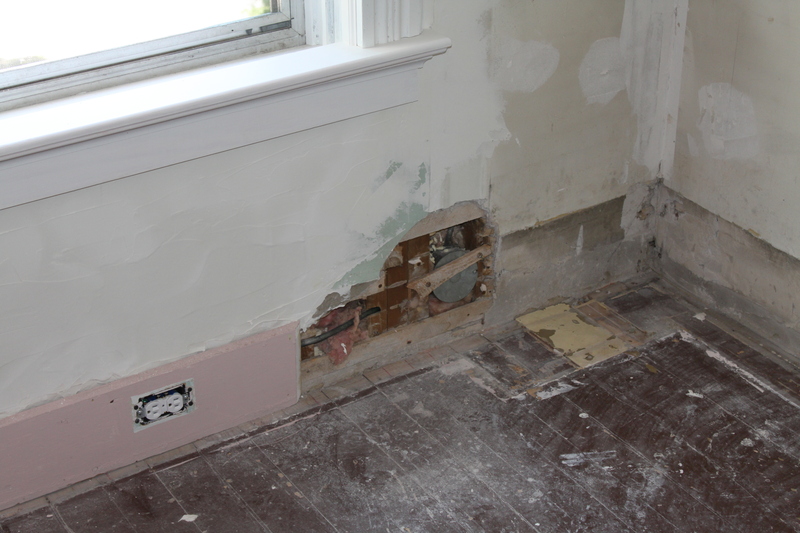 Eventually we’d like to make this part of the room into a master bath, if we could get the plumbing to work. It’s about 8 x 7 feet, so it could work as a nice HUGE walk-in closet, too. Red shelves, don't they go nice with pale pink walls? Day 6: I cleaned, vacuumed really while Bill began to stabilize the plaster in the ceiling. 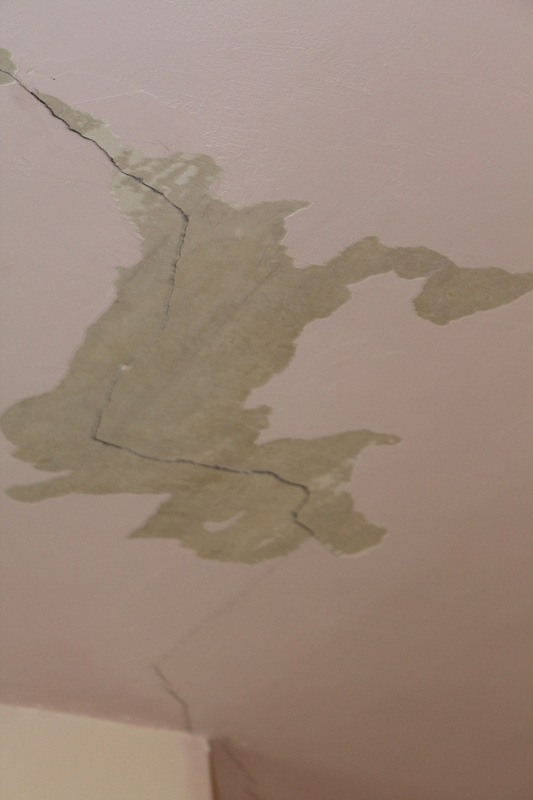 There are mostly cracks, but some lose plaster that needs to be adhered before we can really start plastering over everything. Bill is the king of plastering, so I’m sure he’ll explain the process more thoroughly in another post. Day 7: I put in sash cords on the other two windows while Bill finished putting up the base moulding and repaired the moulding in the interior window. Day 9: Bill finished up all the moulding he could and I started learning how to plaster. 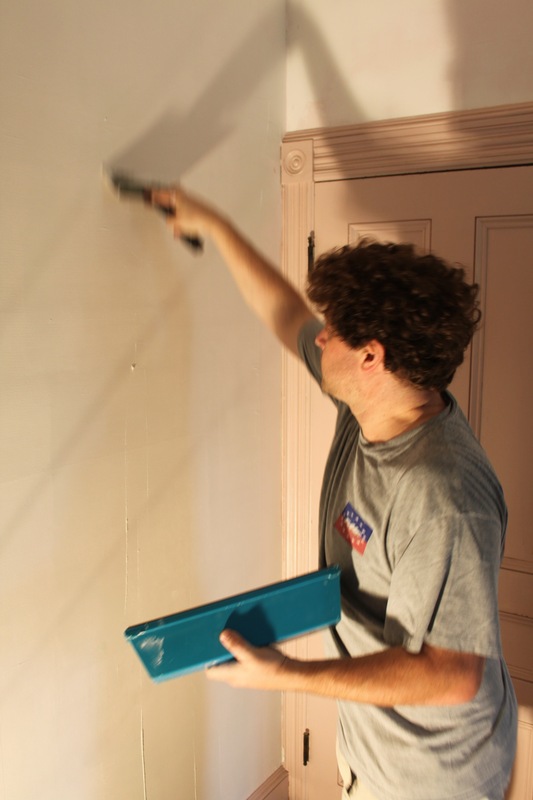 In the afternoon, Bill plastered and I began priming all the woodwork. This room originally appeared to be a light turquoise. 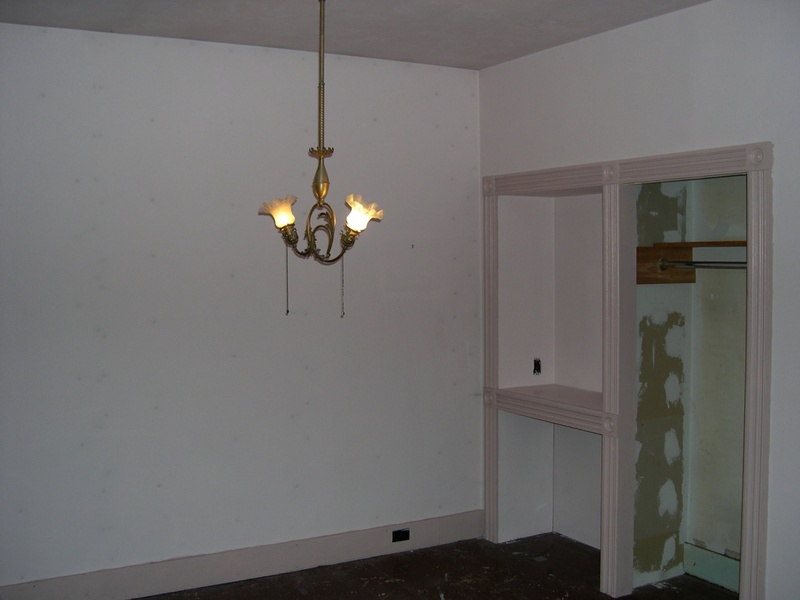 When it was re-done with all the sheetrock and fake closets, it was painted pink, from ceiling to floor and all woodwork in between. Below you can see a closeup of the lathe under the original plaster (which was horsehair) and the reason why we need to do so much more plaster on top and repairing the moulding. . or at least filling in the moulding. When the closet was put in, the owner removed a lot of the moulding and we’ve had to scrounge around the corners of the house to find stuff to fill in. Thankfully, there are years and years of stored goodies in the recesses of this house. And, I’m married to a wood working wonder. Day 10: Bill plastered like a mad man and almost the whole first coat is completed. We won’t even start discussing the floor. That will be a whole new adventure, as this room will have the first floor that we’ll redo from scratch. The master bedroom is going to take a fair amount of work thus the “Part 1” portion of the title. I expect to turn this room into several posts just to keep it moving along nicely. In all fairness the work has begun but has stalled just the same. The master bedroom is one of two bedrooms on the front side of the house. All four bedrooms in the house are on the second floor, two on the front and two on the back. The Master bedroom is the room which had two of it’s three windows covered by a sheetrock wall on the inside. Yes, completely covered over by a wall which was built by the previous owner to the owner we bought the house from. We needed to at least have the windows restated as part of the rehabilitation mortgage agreement’s final audit and inspection. After all, these are two of the most prominent windows on the front of the house! To begin we carefully measured outside to find the windows inside. I took very shallow stabs with a sheetrock saw to be sure I was not cutting near the window glass until we were confident we could locate the windows. The sheetorck was backed by foil covered styrofoam insulation panels nailed through the plaster wall. 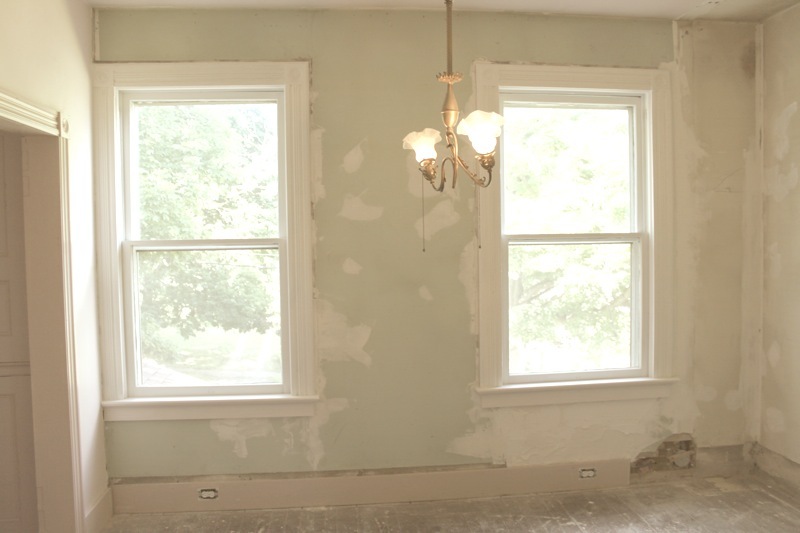 And unfortunately to fit the sheetrock and insulation neatly into place, the installers of the wall stripped the inside windows of all its original trim, moulding and the portion of the sills that protrude into the room. A very sad discovery of what I’d say was a poor choice in the first place. I am happy they didn’t glue the insulation in place! That would have been very damaging to the plaster wall. As luck would have it, our neighbor Dave Lieb who works on old houses and furniture for his profession had some old moulding salvaged from a demolition home that came extremely close to matching the other windows in the room. Dave graciously gave me three bundles of the matching moulding for me to use. All that was left now was rebuilding the sills (which I was able to do from some 5/4 white pine), scrape, prime and paint the sashes and re-hang them with new sash cord! In upcoming posts, Karyn and I will walk you through each day of work on this pink room, from plastering to putting in sash cords, priming and finishing the floors.